I love your blog. Drive-in theaters have been a passion of mine for a long time. I saw your reference to Burger Chef being next to one of the drive-ins. As an aside I worked at Burger Chef back in Owensboro, KY, during the summers of ’72, ’73, and part of ’74. That was my first real job. I still (vaguely) remember the TV ads with this slightly overweight cartoon character, Burger Chef, and his sidekick, Jeff. Don’t recall what Jeff looked like. The restaurant is long gone. Hi Larry! Thank you for the memory! 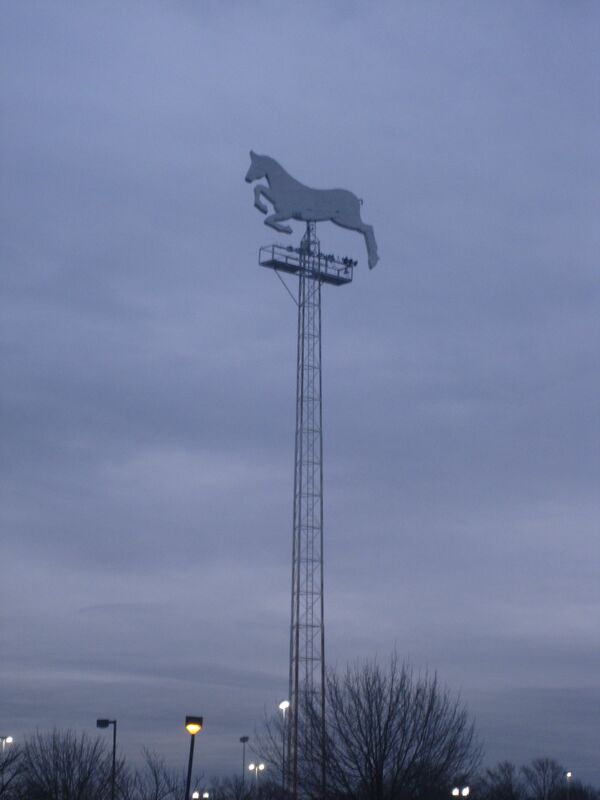 I never got to see this drive-in (it was long gone before I was born), but I loved seeing the horse each day. I was hoping they might restore it again, to no avail. Nice research! Loved seeing the Eric/Sameric ad, too. I remember this drive-in (probably this one) as a very young child – only vague memories of a speaker in the car window and a snack bar that people walked up to. Then I recall a drive-in (WH?) closing while another (BH?) stayed open. I have a hunch the closure must have been close to ’69 for me to remember at all, but of course toddler memories aren’t exactly ironclad historical references. Help wanted ads in the Camden Courier-Post in August and September 1966 were looking for part time help. “See Mr. Marconi.” An April 1967 ad wanted concession men, “Apply in person. Black Horse Pike Drive In or White Horse Pike Drive In” so they were connected. Cool Hand Luke was showing on Dec. 30, 1967 at the White Horse Pike. The Female and Aroused were the first two features at the White Horse Pike on Dec. 26, 1968. 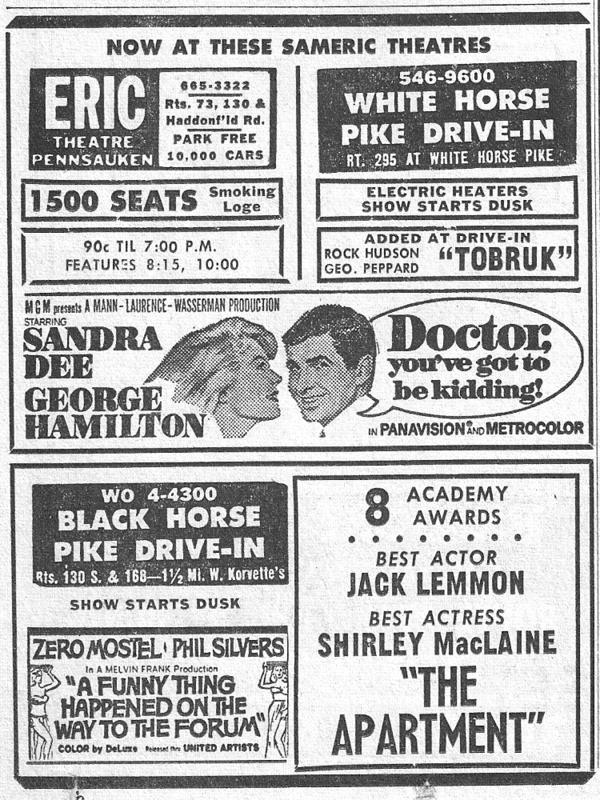 Advertisements for movies at the drive-in continued through March 1969. Hi! Thanks for the information – without a subscription for the archives, I’m limited in my research. 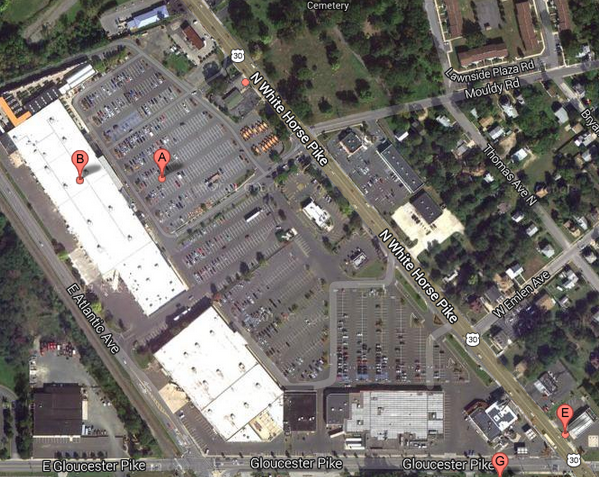 I wonder now what happened between March 1969 and the opening of PathMark and Two Guys. If there was an intended expansion, many things could have went wrong – from funds, to interest, to over-saturation of drive-ins in the area.